7:00 am ... I'm slowly fast forwarded last night's five hour event pausing along the way to check out the fashions and listening to some of the comments from people in the worlds of media, politics, and entertainment and more. Nina Totenberg, American legal affairs correspondent for National Public Radio, gave the best comparison of the White House Correspondents' Dinner - past and present - describing what used to be a limited press dinner is now a major celebrity event with pre-and post parties. It also appears that award season never seems to end allowing people to showcase their work, network, and make statements about current issues. ... 3:38 minutes into the event ... Nice speech by Jason Rezaian an Iranian-American journalist who served as Tehran bureau chief for The Washington Post. He was convicted of espionage in a closed-door trial in Iran in 2015. On January 16, 2016, it was announced that Rezaian had been released. ... Tick tock ... More awards to foreign correspondents and members of the press ... How do hundreds of people sit in such a confined space so long? How many really want to be there? How many will take offense by Obama's comments coming up? ... Four hours into the event ... Video review of "The Obama Years" in office filled with humor, music, and more. Alas his speech. ... Funny ... funny ... funny. Loved Obama's opening joke about CPT (Colored People Time). People who are habitually late are not doing it to be disrespectful or to be the center of attention. It has to do with a processing issue in the brain that deals with time. It is, like everything else, genetic. ... Back to Obama's speech ... He praised Michelle who wore a gorgeous gown ... I also noticed that Obama's hair is getting darker again ... segue back to how it looked before he started his term in office. One should also bear in mind that yes stress affects one's hair but at his age it naturally would have started to gray anyway. ... Great speech as Obama poked fun at everyone including Hillary, Bernie Sanders (in the audience with his wife), Ted Cruz, and of course Donald Trump whose two sons and their wives were in the audience. They did a great skit about Obama living in DC after his term is over. His next gig should be show biz as Trump steps into the presidency and Obama has the last laugh. One thing we can all say about Trump ... he has made the presidential race informative, emotional, and entertaining ... with a touch of intuition and conspiracy. 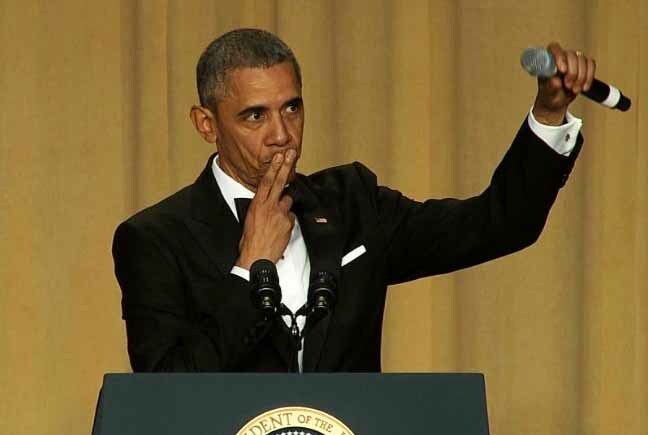 ... 4:36 minutes into the show ... Obama ended his speech telling the audience, "And with that, I just have two more words to say -- 'Obama out'". He brought two fingers to his lips, using his other hand to lift a microphone up in front of him and dropped it in a dramatic fashion, referencing when performers intentionally "drop the mic" to emphasize a great performance. I was happy that I understood all the jokes and recognized many of the journalists as I've only recently started to closely follow politics. This morning on NBC ... "If it's Sunday, it's "Meet The Press" as Chuck Todd gives us political updates, the odds on who is going to win the nominations, and other political rhetoric. As we watch and wait hoping change will come and things will get better ... no matter how you define that ... do we remember what the past has taught us? We're all getting older and with that more forgetful, so perhaps not. Further ... from politics to celebrations of life and merit ... it's all programmed. Collapsing grids and evolving consciousness remind us that time (as in Obama's opening line about time and timing) and reality are shifting in ways that some of us observe and others wonder if they have early onset Alzheimer's or simply lost their minds. We follow the press and honor those who bring the truth to us - from social media to professional correspondents. Obama ... out. President Barack Obama took his leave of the White House press corps Saturday with a sardonic blast at Donald Trump, the Republican Party and even fellow Democrats in his final tart-tongued stand-up riff for the White House Correspondents' Association dinner. Trump, the widely anticipated target of Obama's barbs who was memorably skewered in 2011, was not in attendance -- a fact that did not go unnoticed by the commander in chief. "I am a little hurt he's not here tonight," Obama said. "We had so much fun the last time. And it is surprising -- you have a room full of reporters, celebrities, cameras. And he says no. Is this dinner too tacky for The Donald? What could he be possibly doing instead? Eating a Trump Steak? Tweeting out insults to Angela Merkel? What's he doing?" The dinner is Washington's annual opportunity to pretend it's hip. Reporters mingle with Hollywood stars, top sports figures, business leaders, administration officials and lawmakers who normally avoid the press. But it's also derided by critics as a sign of an overly cozy cabal of Washington insiders -- frustration that has contributed to the rise of political outsiders like Trump and Sanders this year. In fact, the most unorthodox presidential race in modern history points to a comedy conundrum faced by Obama in his farewell address to the Washington insider love fest that the annual dinner has become. How do you satirize -- and in the process land political blows -- on a campaign that has lifted American politics to new heights of self-parody? "In some ways it is strange, because this election campaign is so farcical, so exaggerated," said David Litt, who was the lead writer on Obama's White House Correspondent's Association speech between 2012 and last year. "What outrageous thing can you say about Donald Trump that Donald Trump has not already said?" said Litt, who now runs the Washington operation of the comedy website "Funny or Die." The media coverage that the dinner now whips up makes it a potboiler of political ambition. Some journalists have suggested that Trump's presidential yearnings began burning brighter in that moment of public humiliation back in 2011. Whether that's true or not, Trump did not take any chances of a repeat -- choosing to stay away from the dinner this year as he campaigns ahead of Tuesday's Indiana primary, which could put him on the path to clinching the GOP nomination. (Sanders was the only current presidential candidate at this year's dinner.) Trump told The Hill in an interview that he had been invited by multiple news organizations but decided not to go because "I would have a good time and the press would say I look like I wasn't having a good time." He also complained that contrary to news reports at the time, he enjoyed Obama's roasting and was "honored" by the attention.